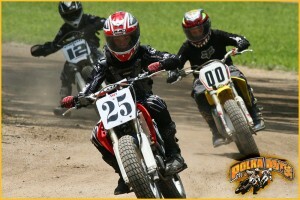 Polka Dots Motor Cycle ClubMotocross, Dirt & TT Track, Hare Scrambles, Amenities. Polkadots has it all! We take care of our people and facilities for you to enjoy! Polka Dots Motor Cycle Club is located on approximately 100 acres of land that is connected to the Pine River. So kids bring your fishing poles. The motocross track is about 1.5 miles long with nice loamy top soil, sand and some clay. Most of the jump faces are clay faced and hold up very good throughout the day. The motocross track was designed for all skill levels, from amateur to the pro level. We do minor track changes from one race to the next, but most of the jumps stay the same. We also have a great ¼ mile flat track and TT track. The track is constructed from clay. And when it comes to preparing the dirt track, there is no one around that does a better job than the guys that put on the races. They put a lot of hard work into the track, to give the racers the very best. And for you crazy woods riders, come try one of our hare scrambles. We have about four miles of twisted turning trails that run through very tight hard woods. We also run the entire motocross track and sometimes the dirt track during our hare scramble race. That gives you about 5 to 6 miles of great riding. And there is no one better to lay out a track through the woods, then our own President of the club, Bob Shinabargar. Bob takes great pride in giving the racers something to remember. There is a food vendor at every race. We also have mosquito patrol, dust control, outside showers and plenty of porta johns. And we at Polka Dots always make sure we have an ambulance and trained medical staff on the grounds at every event. At Polka Dots Motor Cycle Club, rider safety is our number one priority. Copyright © 2019 Polka Dots. All rights reserved.